After watching Game 1 last Wednesday night, my mind was made up that Brian Gibbons would be the feature of my weekly piece. Gibbons has already shown in his first two NHL playoff games what he can bring to the table for the Pens. He's skated under the radar for most of the season, and for good reason. He has a lot going against him... a small frame at 5'8" and 170-ish pounds, and trying to find playing time on a team of superstars and veterans. Yet he has proven his worth to this team throughout the season time and time again. So how much does Brian Gibbons mean to this team? Let's take a look at a few things. First, the current situation. He is tied for the team lead in playoff goals with Matt Niskanen at two. His corsi through two games is in the top 5 of the team. He has provided a spark to this team with his speed and tenacity throughout both games. It is a lot of the same things he has been doing throughout the season for the Pens, but it is nice to see him finally get rewarded for it. He has also shown his versatility for this team. He spent much of the season on the 3rd or 4th line, and he made solid contributions in the bottom six. 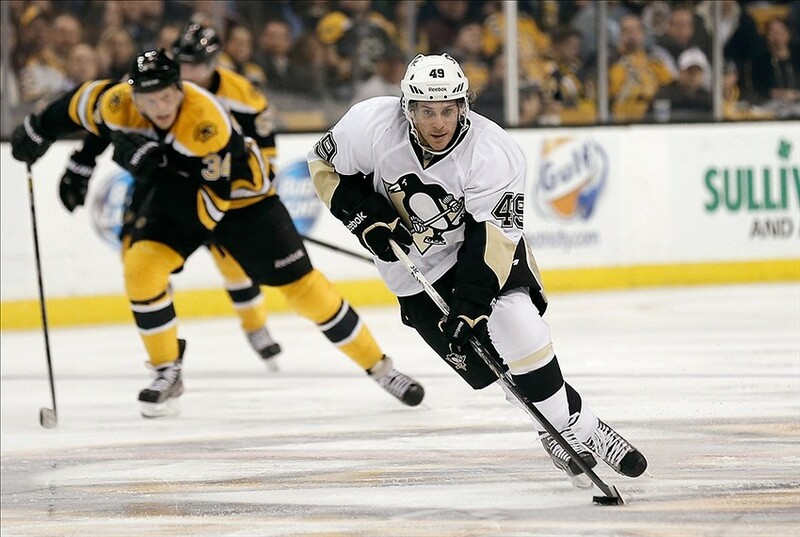 Through these first two games, however, he has shown he has the ability to play with Crosby and Kunitz. While he may be small in stature, he is fearless in his puck-battling in the corners, and he is not afraid to get to the front of the net (where he scored his first career NHL playoff goal). 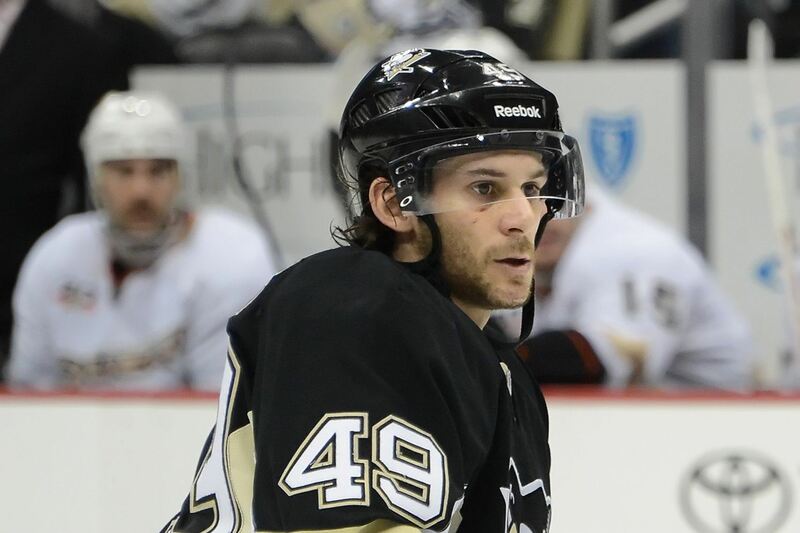 His game reminds me a lot of another Penguins' player, who is also a fan-favorite, but I will get to that in a bit. One of the things that many people dislike about Gibbons is his goal celebrations... or lack there of as it were. When he has scored goals throughout the season, he does not celebrate, in fact, he barely smiles. While I would probably like a bit more emotion from him, I like the fact he is all business. He acts like he has been there before and leads the league in scoring. Not everyone has to jump into the glass and act like an idiot when they score a goal -- looking at you Mr. Ovechkin. He did have a large smile on his face after his second goal Saturday night, and who wouldn't? He scored a short-handed breakaway goal after he completely undressed Bobrovsky. The building was going crazy. The team was hopping. THIS is the spark the Pens needed. It is no surprise that when he was injured a few minutes later the team never looked the same. number. Since returning Feb. 27, they have killed only 80.2 percent of their penalties. -The Penguins have allowed a power-play goal in 12 of their past 20 games. His piece was written before Saturday's game when the Penguins gave up 2 power play goals in 6 chances to the Blue Jackets. Thus far for the series, the Pens are killing penalties at a 70% clip, which will simply not get it done in the playoffs. Toward the end of the season, Gibbons started to receive more time on the PK. He seems like the best replacement for Dupuis in my mind. He has a similar game and work ethic. As I mentioned above, he has a tenacious forecheck to go along with his foot speed. He is also a 'heady' player, so to speak. When he was on the PK for game 1, he ragged the puck for 15-20 seconds, and he also setup Brandon Sutter for a great short-handed chance because he drew two defenders to him in the offensive zone. One of the biggest reasons the PK has struggled since Dupuis has left is the lack of a short-handed threat from the Pens. With only four regular season short-handed goals, three from Sutter and one from Maatta, teams can cheat a bit more on the power play. They aren't very scared of Tanner Glass or Craig Adams, nor should they be. That was one of the biggest things Dupuis brought to the table, and it is something that Gibbons has done beautifully when given the chance. Before this series started, many keys were mentioned. The stars needed to show up. The Pens needed to win the special teams battle. Marc-Andre Fleury needed to be sharp and exorcise his postseason demons. All valid keys, and unfortunately only one of these has happened so far with Fleury coming up huge. No where did anyone mention Brian Gibbons, and why would they? He is a rookie with no playoff experience and is much smaller than most of his counterparts. The area he has an advantage in over most of his teammates comes from the one thing scouts, analysts, or fans can't measure... heart. He has displayed what the majority of this team is lacking in determination and the want or will to win. It is something we come to expect from the Pens because we have seen what they can do when they WANT to do it, and they haven't wanted to win in the postseason for a few years now. Here's hoping Gibbons' day-to-day injury lets him return to action sooner rather than later because the Penguins first-round success just may depend on it.